Design Bridge has created the branding and packaging for a new range of sauces from Van den Bergh’s Colman’s brand. The dual sachet dry sauces will be in stores from mid-August. Design Bridge has created the branding and packaging for a new range of sauces from Van den Bergh’s Colman’s brand. The dual sachet dry sauces will be in stores from mid-August. Described by a consultancy spokeswoman as “a complete meal solution”, they will be targetted at “today’s hassled mums”. The protein and carbohydrate elements of the product come in separate sachets. 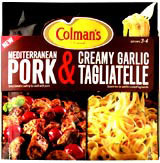 Although the packaging features a prominent version of the Colman’s identity, the product seeks to remove itself from a homely image towards a more “foodie” one. Initial variants include Cajun Chicken & Southern Fried Wedges and Oriental Beef & Sweet Pepper Noodles. Colman’s brand activation group manager Natasha Bell says the brand, “Respects the roots of the Colman’s brand”.